The ratio of n-6 to n-3 fatty acids is much too high in the Western diet. (Quote)"In the United States, the intake of n-3 fatty acids is approximately 1.6g/d ( ± 0.7% of energy), of which 1.4 g is Alpha-Linolenic Acid (ALA; 18:3 n-3) and 0.1-0.2 g is Eicosapentaenoic Acid (EPA; 20:5 n-3) and Docosahexaenoic Acid (DHA; 22:6 n-3). The primary sources of ALA are vegetable oils, principally soybean and canola. The predominant sources of EPA and DHA are fish and fish oils. Intake data indicate that the ratio of n-6 to n-3 fatty acids is approximately 9.8:1. Food disappearance data between 1985 and 1994 indicate that the ratio of n-6 to n-3 fatty acids has decreased from 12.4:1 to 10.6:1. This reflects a change in the profile of vegetable oils consumed and, in particular, an approximate 5.5-fold increase in canola oil use. The ratio of n-6 to n-3 fatty acids is still much higher than that recommended (ie, 2:1). Lower ratios increase endogenous conversion of ALA to EPA and DHA. Attaining the proposed recommended combined EPA and DHA intake of 0.65 g/d will require an approximately 4-fold increase in fish consumption in the United States. Abstract from the article by: Kris-Etherton PM; Taylor DS; Yu-Poth S; Huth P; Moriarty K; Fishell V;Hargrove RL; Zhao G; Etherton TD. &QUOT;Polyunsaturated fatty acids in the food chain in the United States.&QUOT;, published in the American Journal of Clinical Nutrition, 2000 Jan, 71(1 Suppl): pages: 179S-88S. "A workshop on the Essentiality of and Recommended Dietary Intakes (RDIs) for Omega-6 and Omega-3 Fatty Acids was held at The Cloister, National Institute of Health (NIH) in Bethesda, Maryland, USA, 7-9 April 1999. The workshop was sponsored by the National Institute on Alcohol Abuse and Alcoholism-NIH, the Office of Dietary Supplements-NIH, The Centrer for Genetice, Nutrition and Health, and the International Society for the Study of Fatty Acids and Lipids: and co-sponsored by several Industry groups." 2.22 grams of alpha Linolenic Acid (ALA; 18:3 n-3). 650 milligrams of Eicosapentaenoic Acid (EPA; 20-5 n-3) and 300 milligrams of Docosahexaenoic Acid (DHA; 22:6 n-3). The Cloister workshop also recommends that pregnant and lactating women should take 300 milligrams of Docosahexaenoic (DHA) per day. The gap is large between the Western Diet essential fatty acid content and the recommendations of the Cloister workshop. The daily Western diet contains on average 15 grams of Linoleic Acid (LA 18:2 n-6). This is about 3 to 4 times mote than what is recommended (4.44 to 6.67 grams per day), 1.4 grams of Linoleic Acid (LA 18:2 n-6), almost two times less than recommended (2.22 grams), and 100 to 200 milligrams of combined Eicosapentaenoic Acid (EPA 20:5 n-3) and Docosahexaenoic Acid (DHA 22:6 n-3), about 3 to 6 times less than recommended (650 milligrams). 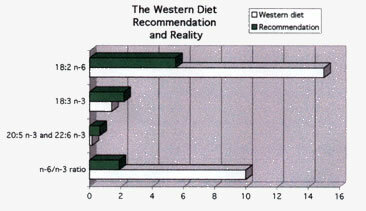 The n-6 to n-3 ratio from the Western Diet is 10 to 1, almost five times the recommended ratio of 2 to 1. In Australia the n-6 to n-3 of the diet is 15 to 1. The Dietary Guidelines for Americans published in 1995 do not contain any mention of essential fatty acids. In the Obsolete Food Guide Pyramid, fish, the sole provider of a full assortiment of essential fatty acids from the n-3 family is drowned amid other food components in the Meat, Poultry, Dry Beans, Eggs, and Nuts Group, suggesting that nothing valid differentiates fish from meat, poultry, dry beans eggs and nuts. Health professionals and the public rely on official publication like the Food Pyramid to make an informed food choice. It is therefore regrettable that the Food Pyramid of the U.S. Department of Agriculture, U.S. Department of Health and Human Services ignore the importance of food containing omega-3 essential fatty acids. The n-6 to n-3 essential fatty acid imbalance in the Western Diet is mainly a n-3 essential fatty acid deficiency. In Australia the n-6 to n-3 ratio of the diet is 15 to 1. The n-3 essential fatty acid deficiency in the Western Diet is an important factor in the prevalence in our Western World of several health deteriorations, the N-3 Essential Fatty Acid deficiency Diseases.